Guitarist Brian "Robbo" Robertson needs little introduction for long time fans of Thin Lizzy or Motorhead. To the former, Robertson was there for Lizzy's break out albums Fighting and Jailbreak among other from 1974 to 1978. He was recruited for Motorhead in the early Eighties, during a period of significant transition, and lacklaster accomplishment, for the band. Now, you're wondering: what's he doing now? Well, that's a bit complicated. However, you probably thought that Mr. Roberston had released a solo album, or several, some time in the past. But you'd be wrong. 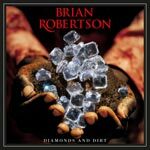 Diamonds and Dirt is his first solo album in his lengthy career. The genesis of Diamonds and Dirt comes from a bunch of tapes, Robertson's previously unreleased compositions. But the work also includes several tracks that have history. It's Only Money comes from Thin Lizzy's 1974 Nightlife, and Running Back from 1976's Jailbreak. (Robertson also includes a slow version for the latter.) Blues Boy is an unreleased song that he co-wrote with Phil Lynott. Finally, there are three songs from his work on Frankie Miller's Dancing in the Rain (1986): Mail Box, Do It Till We Drop, and Ain't Got No Momey (with Riverdogs vocalist Rob Lamothe on vocals). All the songs get a proper and hearty performance. The two versions of Running Back and Do It Till We Drop are quite entertaining. But all the tunes should make you want to revisit the albums if you have them (or buy them if you don't). Frankly, it's hard to believe that Brian Robertson hasn't cut a solo album. Diamonds and Dirt is excellent, quite the diamond in the dirt for melodic hard rock in 2011. Strongly recommended.